Present estimates of Guyver abilities have been compiled and summarized below. -Physical strength: Subject possesses the strength of 1000 men and has nearly unlimited stamina due to a quantum singularity, which is the primary source of this Units immense gravitational power. -In place of Units Hyper Sensors, the subject has a polymorphic material that normally takes the form of greyish white hair. The subject can use this hair as whip like vibrational sword weapon, with a variable range that has been known to reach up to 15 feet. 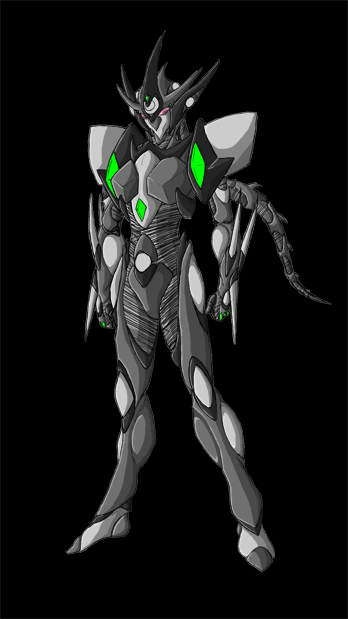 Though subject doesn’t have standard Guyver hyper preceptors, the subject has been observed to be able to detect enemy movements for a range of 1 km (~3282 Feet). The subject can also use the polymorphic material to fire a hail of dart like vibrational strands in almost any direction and is often used in tandem with units head beam. -Durability: Subject can withstand the equivalent of two Guyvers full double mega smashes unshielded, due to subjects high molecular density and power level, and can withstand anything up to a 10 kiloton explosion with its gravitational shield. Estimated regeneration rate is at least ten times faster than normal for a Guyver. The subject can also absorb almost any form of energy directed at it at a rate approximately equal to 12.8 giga joules per second, making subject very difficult to damage. -Speed: Subjects has a reflex speed that ranges from 50 to 400 times normal, a top ground speed of up to 2000 MPH, and a top air speed of 15000 MPH. -Subject Head Beam has twenty times the energy output of a standard unit. -Subject has a two pairs of elbow swords and one pair of forearm swords. Though they appear to be standard Guyver vibrational weapons, they have a much higher tolerance level due to subjects high power level and greater than normal density. The subject has also demonstrated the ability to channel part of its gravitational power through swords to either enhance them and/or to fire pressure cannon blade blasts. -Subjects Mega Smashers are equivalent to a normal Gigantic Guyvers. Whether subject can use this weapon multiple times or can augment its power output is unknown as the subject relies heavily on its gravitational based powers, but it is theorized that subject can boost effective destructive power of this weapon by 20 percent by focusing units gravitational power to enhance the energy output of this weapon. -Subject has no sonic emitters but can easily create gravitational shock waves to produce the same effect. -Gravitational powers are this units primary source of power. It is theorized the Units CM contains a piece of an experimental Zoacrystal that contains an artificial quantum singularity and is the primary source of this Units gravitational power. The subjects two shoulder crystals appear to be secondary gravitational control devices that help channel and control the subjects immense gravitational energy. The subject also has a standard Guyver gravity control orb. This grants the subject all the combined gravitational powers of a Gigantic Guyver and a Supreme Zoalord. The subject can fire up to three Zoalord type black hole attacks in one second or a single pressure cannon blast, with six times the destructive power of a normal Guyvers full double Mega Smash. The subjects shield can even be used to affect space/time around subject for up to 100 meters. Effects range from simple gravitational shock waves to slowing time to 1/100 normal, the later effect allows subject to appear incredibly fast to targets within the affected area. -Other Gravitational powers include a gravity shield attack similar to the Warrior Guyvers, this allows subject to create a powerful enough gravitational energy charge to create worm holes for teleportation and for short bursts of faster than light travel. Subject can also use this ability in the same fashion as the Warrior Guyver and direct it for extremely powerful attacks. The subject can also use its gravitational power to cloak itself by bending all E.M. radiation, including light, around itself. This cloak effect can also be used to distort targets sensory perceptions and/or to create false images of subject and surrounding objects, similar to the visual affects of a carnivals fun house of mirrors. -Reports indicate subject may also be able to use its gravitational power to put itself out of phase with normal matter, which allows subject to pass through most objects like a ghost. The subject may also be able to do this by warping space/time enough to move the molecules of an object around itself as it passes through, though this may be fatal to a living being, most normal matter would appear to become liquid as the subject passes through. No other conclusions can be confirmed until further data is gathered. Copyright © 2019 WarriorGuyver.com. All rights reserved.